“Boyhood.” IFC Films. July 2014. Boyhood is one of those special movies that’s engaged with the process of growing up honestly; and rather, it captures it for the first time in cinematic history. Filmed over a span of 12 years, director Richard Linklater captures the real aging process of a fictional boy named Mason (Ellar Coltrane) and his surrounding family—his struggling single mother Olivia (Patricia Arquette), older sister Samantha (Lorelei Linklater) and rock ‘n’ roll ex-father Mason Sr. (Ethan Hawke). As we revel at the boy’s once doe-eyed face grow older and tenser as his jaw becomes more defined and his slender stature takes form, it’s amazing to see these characters age right before our eyes, naturally—without any makeup or prosthetics—in just under a mere three hours in our seats. The film takes us from 6-year-old Mason to just after his high school graduation. We gradually see him get moodier as he feels embarrassed by his mother’s embrace at one moment and later grows into his awkward adolescent years, talking to girls and experiencing heartache. Linklater poignantly brings us back to key moments in history with him as well—times we may have played Halo for the first time on the XBOX, busted out to Britney Spears’ “Oops! I Did It Again,” danced along to High School Musical or waited in line for the massive Harry Potter premiere. Remembering these moments in time ourselves, we are given an astonishingly real and personal recollection of our own memories, which hits the nostalgia factor hard. As we meet an old passerby in the family’s life who tells Olivia, “Thank you for changing my life,” we are reminded of the power of our mothers. As we observe the mother constantly bending her left leg in the film to care for her family—finding and losing love, returning to school, experiencing financial and emotional abuse—the moment the passerby looks to her kids and says, “Listen to your mother, she knows what she’s talking about,” the moment is more powerful than we initially thought. 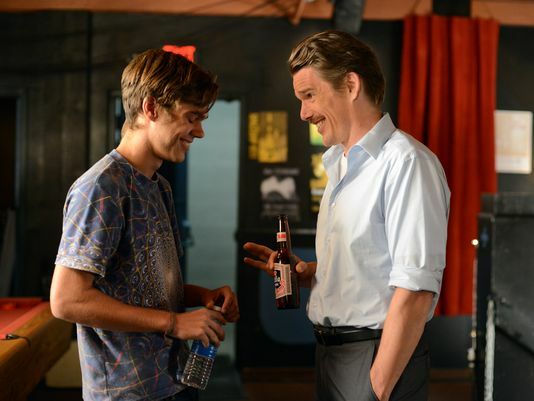 Ellar Coltrane as Mason and Ethan Hawke as Dad in “Boyhood.” IFC Films. Mason Sr. comes into the picture from time-to-time, making his timely visits and offering his kids quality-bonding time with dad; though, through these moments we see how unprepared and unfit for fatherhood he really is. Rather reckless and careless, he supports his kids one-hundred percent throughout the years with all he can provide; yet, as he is still taking his own time to grow up, it’s touching to see how he himself ages and matures over the years as well. His growth helps us to realize that age and maturity is a progression in life, as we all grow in our own separate and distinct ways. But, perhaps most compelling is the story of the Mother. As the brunt of parenting fell on Olivia’s part, however, it was amazing to see Arquette allow herself to age on-screen. Her hair changed, weight fluctuated, small facial expressions and attitudes naturally transformed over the years. For me, this film spoke deeply as to how easy it is to miss much of our own parents’ efforts and sacrifices in raising their children. And Arquette, who had even gotten pregnant in her own life, was able to provide audiences a genuine reality of motherhood. As Olivia would experience marital and financial problems, you could feel her sincerity and stress as motherhood gracefully surfaced on her face. Linklater was not shy in allowing his film to recognize this. Though, as Mason and his sister go through their awkward years and fall in and out of love, it paints a genuine picture of what kids—we ourselves—have felt during those times. What’s wonderful about this movie is that we watch these events happen before our eyes and it allows us to take these moments in our lives in hindsight; it is almost like we are watching ourselves unravel on-screen. And it feels mesmerizingly familiar, painful, funny and personal. The passage of time here is real—something not a lot of films have had the luxury, time or patience of doing. It feels loose, natural and looks and feels real to us because, in a way, it kind of is. We watch boyhood, girlhood, motherhood and fatherhood naturally unravel on-screen. And that’s what makes Boyhood special—it’s incredibly real. We see ourselves in the faces of these characters. 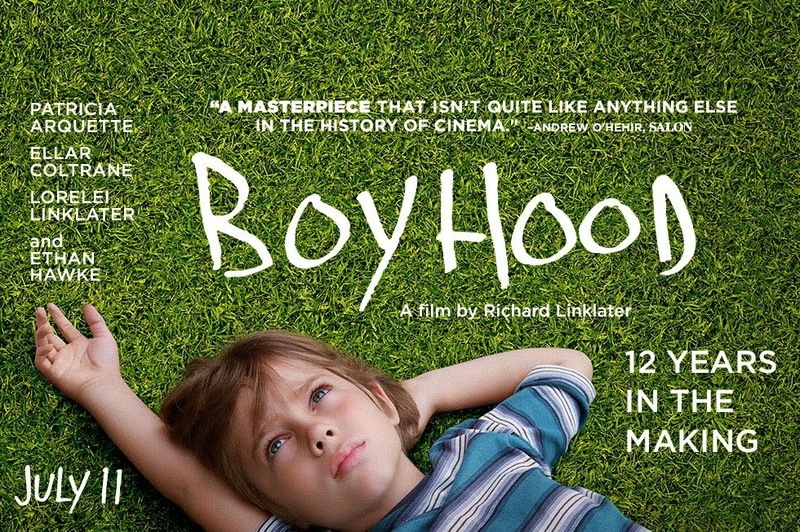 Boyhood is an extraordinary film that perfectly captures both the process of growing up and nostalgia for the pop culture of the twelve years it was filmed. Patricia Arquette as Olivia and Ellar Coltrane as Mason in “Boyhood.” IFC Films.